While a flexible OLED does enable a higher display-to-body ratio (82.9% on the iPhone X, for example), a high end LCD comes pretty close - the Oppo F5 reaches 78.1%. 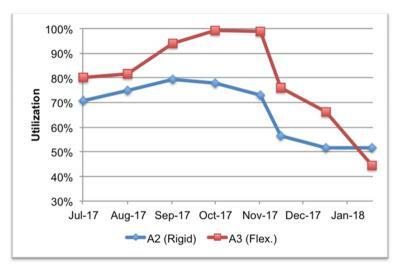 DSCC shows SDC's current fab utilization rates, and you can see how its flexible OLED lines dropped from almost 100% utilization at the end of 2018 to around 45% today. Samsung's rigid OLED production also dropped from around 80% in September 2017 to 50% today. DSCC estimates that Samsung is facing a difficult challenge, as its flexible OLED sales are dependent on high-end modules, and is very dependent on Apple. It is not likely that flexible OLEDs will be adopted by smartphones that are not high-end flagships. 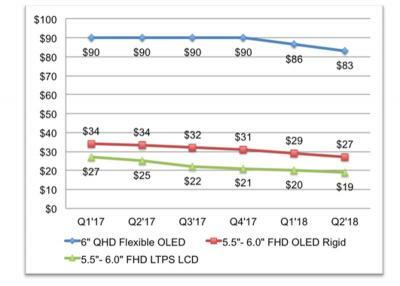 DSCC sees the situation resolved in the second half of 2018, as Samsung is expected to lower the prices of its flexible OLEDs and achieve more design wins.